If you ask any good survivalist what one item they would want if placed in a wilderness survival situation, likely all of them would argue a good knife. A good cutting tool helped shaped most civilizations and started with crude objects like flint knives, sharpened bones, rocks, and wood, and eventually became the knives we’re more familiar with today made of metals and hard plastics. The lightweight backpacker often finds themselves in quite a quandary when deciding which knife to carry while backpacking. Some people who count every ounce often don’t carry one at all assuming they will not need it due to personal knowledge of their environment or the reality that they may be hiking close enough to civilization that a survival situation requiring a knife is irrelevant. For the rest of us, we must make a choices based on experience, environment, and personal comfort, as each may use a knife for different reason (survival, utility, protection, etc.). There are many lightweight choices for backpackers concerned with counting ounces. 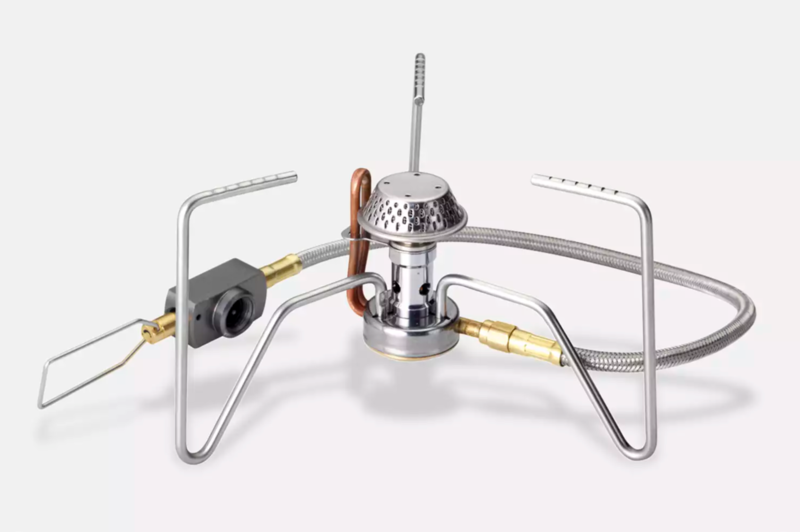 Some may seem more practical than others, but it depends on the person. 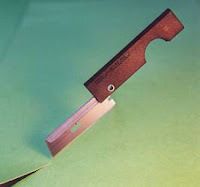 Some choose to go to the extreme of carrying a single razor blade and others have been known to use a single razor from a broadhead (bloodletting arrowhead) attached to something. Likely one of the most lightweight options is a simple razor such as the Derma Safe Folding Utility Knife (http://www.derma-safe.com/folding-utility-knife.html). Swiss Army makes a ton of various “multi-tools” which contain at least one cutting blade as well as other options. 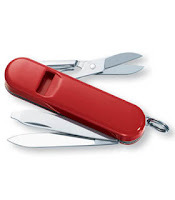 Many lightweight backpackers seem to prefer the “Classic” (http://www.swissarmyknifemall.com/product/53181-mo) which consists of a cutting blade, nail file, scissors, tooth pick, and tweezers. 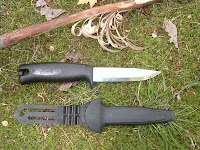 Ultralighters often cannibalize this knife to obtain only that which they need and to discard other parts which cause unnecessary weight. Building off the “Classic” model, some prefer one which offers a whistle (http://www.swissarmy.com/MultiTools/Pages/Product.aspx?category=originalswissarmyknives&product=53933&). The pealess whistle does sound, but it isn’t quite as loud as a Fox 40 or other survival whistle. 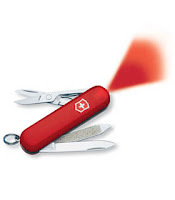 Still others who like the “Classic” model lean towards having a light source integrated into the system like the “Swisslite” (http://www.swissarmy.com/MultiTools/Pages/Product.aspx?category=originalswissarmyknives&product=53020&). 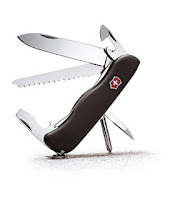 Others who want something a little heartier lean towards the “Swiss Army Trekker” (http://www.swissarmy.com/MultiTools/Pages/Product.aspx?category=lockblades&product=54854&) which offers a locking blade and a nice saw feature. 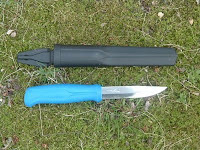 For those convinced they need a fixed-blade knife, my recommendation is for the Mora of Sweden line. These knives are made with incredibly hard and durable steel, carbon, or stainless steel and are very low weight compared to others. They are also very inexpensive, usually less than $12.00 (USD). Laminated carbon options, such as the F780 (http://www.bensbackwoods.com/servlet/Detail?no=60) are excellent field knives and hold an edge well, but are subject to problems with moisture. If around moisture, a better option is a stainless steel blade such as the Mora M545 (http://www.bensbackwoods.com/servlet/Detail?no=165). Compared to other more conventional knives which weigh anywhere from 8-12 ounces, these weight around 3.2-3.8oz with their sheath. Many other people carry genuine "multi-tools" like those made by Leatherman, Gerber, Buck, and others. Although these tools offer a tremendous variety, they come with the cost of weight and therefore aren't often a realistic option to lightweight backpackers. There are many other knife manufacturers which offer better blades, but they too tend to be heavier and fancier than necessary and not really appropriate for prolonged wilderness conditions. Some near tiny options include key chain knives which aren't very stable and don't offer a realistically useful blade for backwoods needs. After heading off on my own over the last two weeks to take on some solo hikes, my wife and I had the chance to hike an old stomping ground - Big Meadows, in Shenandoah National Park. As a kid, I went to Big Meadows with my family many times. More often then not I was more interested in what I could put in the fire then what I could see on the hike. Oddly enough I also don't remember ever hiking the actual 70 acres of the "big meadow" which gave this destination its name. 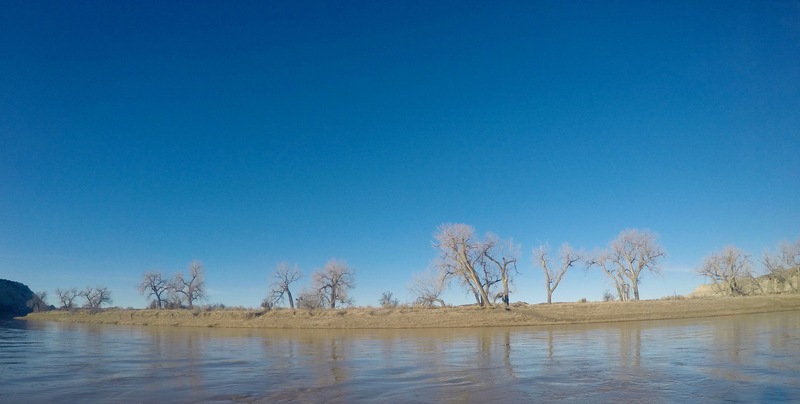 Located 3,510 feet above sea level, this area was known for wandering elk and buffalo prior to the 1900's. Climate change and population increases in Virginia ultimately ran these guys out and replaced them with deer, brown and black bear, and fox to name a few. During our trip I wanted to make sure I paid attention to the little things often missed during a hike where the intent is to cover distance. The hike of the meadow proved to be a great opportunity to take a look at over 200 different types of plants and all kinds of animals. I also learned pretty quickly that finding an old apple tree ensured I could nearly put a saddle on most of the fairly tame deer in the park. On the way back from dinner shortly after sunset, a mama bear and her two cubs ran across the road and disappeared into the woods. Against my better judgment, I immediately pulled off the road and dove into the brush without a second thought. Armed only with a camera that couldn't take a picture in such poorly lit conditions and my clearly tiny skills to make a sound judgment, I headed off in the direction of snapping twigs and snorts. My wife stayed behind which was a smart call because she probably would have needed to point rescuers in my general direction once my curiosity officially got the better of me. As I batted away thorn bushes and silkweed, and hoped that there were no snakes under the fern-laden ground cloth which made viewing the path impossible, I saw a cub shoot up a tree, take a look at me, then head off into the darkness. I quickly ran after it as thoughts of being digested by a bear ran through my mind. In the darkness I could hear twigs snapping and rustling seemingly right around the corner and I slowly made my way towards them. About 20 feet in front of me another cub went scurrying down a huge tree and ran off again into the darkness. I could still hear something up in the tree and made my way closer. As I stepped nearly under the tree to gain a better vantage point being that I couldn’t see anything until I moved pass other foliage, I came face-to-face with the absolutely gigantic mother bear who was so far out on a limp I couldn’t imagine how the tree didn’t topple over. The bear took one look at me, growled loudly, and made an instant jump as if it was going to charge me. Short of soiling my pants, I quickly decided that was enough and immediately headed out while talking as kindly as I could to the bear so she knew I was human, a human headed away, and a human not interested in her or her cubs. When I got back to the car, my wife said she could hear me talking to the bear and knew that I was yet again trying to find a way to test my life insurance policy.